I'm hosting my 5th annual DominoART Scarefest again this year and also playing as a Wicked Blogger in the massive 7th annual Smeared Ink 31 Days of Halloween again too! September has been crazy busy preparing and now hectic October has begun with all the 31 DOH post writing, hopping, commenting, scavenger prize hunting and Halloween party celebrations! I'm exhausted already LOL but it is always so much fun and totally worth it ;0) So pop on over to DominoART and join us! It's also not too late to join the fun coz I've got 4 spots left on my Wicked Players list so do come and join me! I've got different photos up at DominoART plus a little video to get you in the mood! I found the hexagonal jar at Hobbycraft when I was in the UK for summer vacay and knew immediately what I wanted to make with it so came home with 2 LOL! I stamped 6 white standard sized dominoes with the Smeared Ink Creepy Grumpies in black StazOn ink and heat set. Also stamped the mini Love Grumpie onto a Lexicon game piece for the lid. Each domino was coloured with Sharpies using my signature Sharpie Domino Queen technique. I normally would seal the entire domino with a coat of Judikins Diamond Glaze but I only wanted their eyes to be super glossy and 3 dimensional so I sprayed them with Krylon Artists Workable Fixative first and then glossy sealer before adding the Diamond Glaze to their eyes. Each domino was then adhered to the jar with Dianond Glaze. I decorated the lid with a cut strip of Tim Hotz spiderweb paper tape and adhered the tile to the lid. 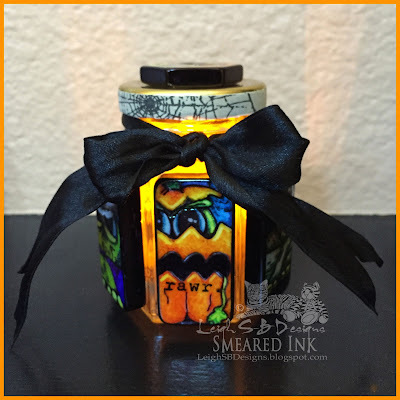 I completed my luminary with black silk ribbon and added an orange flameless tea light inside. It looks soooooo wicked cool lit up! See you over at DominoART and join the spooktacular fun! Im here from the hop of 31 days ...had to come look at more pics and hows it done lol love it !!! This is great leigh, love the grumpies :) The jar looks great lit up.